This is a locational name of two possible meanings and origins. It derives either from the village of Hendon in Durham which translates as "The Valley (denu) of the hind" (hind) or from Hendon in Middlesex where the origination is "Heane-dune" - the high hill. Both are Old English pre 7th Century and whilst the Middlesex village is recorded as early as 959 A.D. in the Anglo-Saxon chronicles as "hendun", the Durham village is not recorded until 1382 in the County Pipe Rolls. The surname is not surprisingly, well recorded in the London area in a wide variety of spellings including Hendoone (1581), Hindan (1690) Hendin and Hendon, the first recording of the latter would seem to be Anne Hendin who married Anthony Pearson at St. Brides Church, Fleet Street, London on January 24th 1652 in the reign of Oliver Cromwell (1650 - 1658). 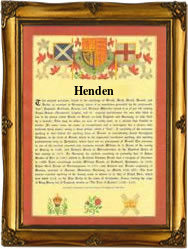 The first recorded spelling of the family name is shown to be that of Mary Henden, which was dated January 25th 1567, who married Jesper Blanckes at Christchurch, London, during the reign of Queen Elizabeth 1st known as "Good Queen Bess", 1558 - 1603. Surnames became necessary when governments introduced personal taxation. In England this was known as Poll Tax. Throughout the centuries, surnames in every country have continued to "develop" often leading to astonishing variants of the original spelling.